The beauty of content marketing is that the best ideas win. Outsmart your competitors, and you won’t need to outspend them. Give readers what they need before they know they need it, says George Stenitzer, founder and chief content officer at Crystal Clear Communications. “When you present prospects with information about a need they hadn’t considered before, it’s likelier they’ll buy from you,” he notes. 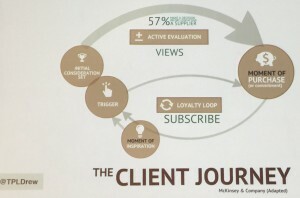 Here’s a model of the buyer’s journey, as mapped by Andrew Davis. Focus on Moments of Inspiration. But you still need buyer journey models to optimize your content marketing. 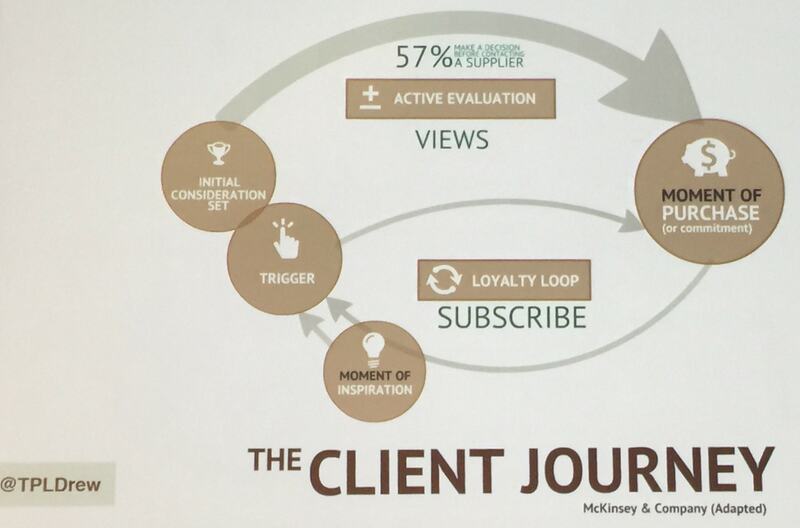 The right model for your buyer’s journey adds tremendous clarity and insight to your content marketing strategy. Here’s a 1-minute video on the future of content marketing. 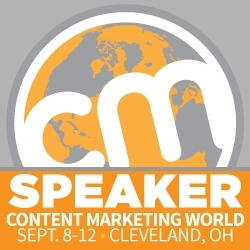 I spoke at Content Marketing World! The key to content marketing: Help customers before you sell. Marketing disruptive technologies takes an innovative marketing plan and persuasive content. Here’s how we marketed disruptive technology at Tellabs, winning recognition as a BtoB Best Marketer for 2 consecutive years. Aim for thought-provoking content that challenges your customers’ sense of the status quo. Customers love stories about threats and opportunities that will happen over the next 3 to 5 years. Here’s a presentation on how smaller companies can win a David & Goliath battle against bigger companies. Use the slingshot of content marketing. 4 tips to get your customer’s attention in 7 seconds. Here’s how to build a message you can deliver in 7 seconds. That’s perfect for a headline, subject line, Tweet or elevator speech. Small firm uses “Pufferfish Marketing” to land big customers. To win big new accounts, get really close to your customer, then apply Pufferfish Marketing to make your brand appear big. How Tellabs won BT business. Thought-provoking content challenges customers’ thinking. That’s what Sales needs most from marketing. At Tellabs, George Stenitzer commissioned original industry analyst studies to create thought-provoking content customers could not resist. To capture customer attention, make sure the story’s about them. This Q&A with George Stenitzer talks about why marketers need to celebrate customers’ successes. How Tellabs celebrated 9 customers’ successes in its video, digital, social and print content. The role of technology marketers is changing quickly. So marketers need to embrace content marketing, take advantage of digital and social media, and challenge customers with thought-provoking content to leapfrog past competitors. Thought-provoking mobile and social content win attention and customers. With sound strategy, a company blog, magazine, videos, social media, and other content marketing add up to success, winning recognition as a Fierce CMO BtoB CMO To Watch. Content Marketing World. How to Speed the Journey from Content to Cash. Here are links to my presentation, to an infographic and a blog. Marketing World, A Frost & Sullivan Executive Mindxchange. Sales & Marketing Crossfire: If You Only Understood Me, We Could Get Along.